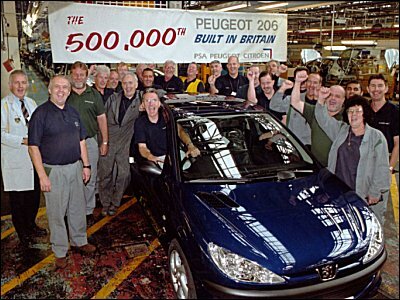 Staff at Peugeot's Ryton plant are celebrating after the half-millionth 206 to be built in Britain rolled off the assembly track. This milestone was reached in record breaking time since the car was introduced in the UK just under three years ago. It is the first time that so many vehicles have been produced so quickly in Ryton’s history. The Ryton plant just to the east of Coventry is one of the success stories of the PSA Peugeot Citroën group. Output has continued to grow in recent years and investment has been available to make this plant the success it is. "It has been a terrific period for the plant in terms of production output and quality and we are well placed to continue with our stunning success. The plant is working at full capacity producing cars seven days a week. "Everyone at Ryton can look to the future with confidence as demand for the 206 remains high. The appeal of the 206 is universal. Cars are exported all over the world and particularly to one of the most demanding markets, Japan. Here in the UK, 206 is the most popular car with private buyers and the second best seller overall. "This year, Ryton will produce nearly 200,000 vehicles which is an increase of about 2% on 2000."